We are situated next to Villagers in Voortrekker Street, McGregor. Johann, Linda, Carla and Tsyun look forward to welcoming you. Please pop in and experience something different. As we are not licenced, feel free to bring your own alcoholic refreshments - no corkage charged! Situated on the picturesque main road of McGregor, Fortyone offers guests a fun and casual dining experience with a friendly atmosphere and great service. We have a fireplace inside, a sunny back garden and a stoep facing McGregor's main street where you can watch the world go by under a cosy blanket. Children and well behaved dogs are welcome too. 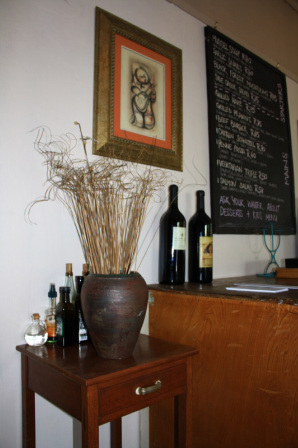 Our relaxed 41 seater restaurant is family owned and operated and opened on the 3rd of February 2011. We are passionate about food and all our dishes are freshly prepared with love and care to give our guests a great dining experience. Fortyone is the ideal venue for families, children, seniors and business professionals. Our friendly environment is great for celebrating special occasions, hosting a business lunch or a gathering for a delicious meal with friends or family. Most meals are available as take aways. Contact us for functions and catering. 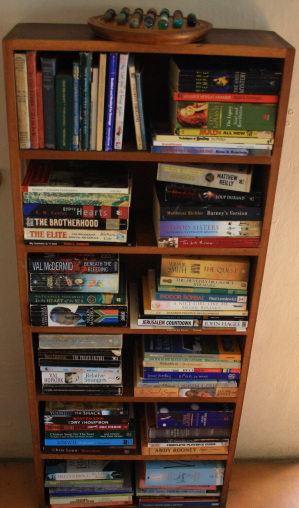 We now also sell a variety of second hand books and antique bottles! Note: Please do not copy and use images without written permission. All images used on this site are taken by the owners and copyright remains with them.